Support several sections of your Panacea modular fencing with these Panacea Black Garden Fence Posts. This package of 12 posts is perfect for keeping your existing Panacea fence sections upright and stable. The narrow body of each post installs through the loops on your existing Panacea Triple Arch Garden Fence Sections (not included) or Panacea Triple Arch Garden Gate (not included), while their oblong top knobs add an elegant hint. A pointed base on each makes them simple to stake into soil, and the black color meshes with your border sections. The all metal construction offers hardiness to the pieces, as well as a unified look. Support a few pieces of your existing Panacea modular fencing with these Black Garden Fence Posts. 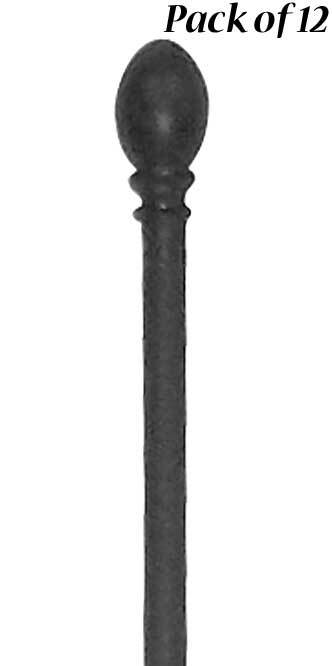 Note: This package contains 12 of the Panacea Garden Fence Posts, Black, 45"H each.